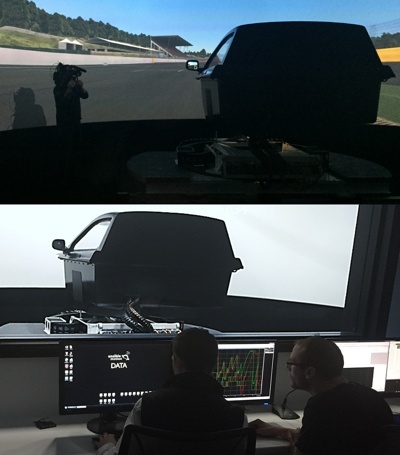 Last month Dean visited Ansible Motion’s R&D Centre to drive our Delta series DIL simulator for Mobil 1’s The Grid. In this guest blog he shares some thoughts on his experience. Simulator sessions are becoming an increasingly big part of a racing driver’s life; last year alone I must have clocked up around 50 days of virtual testing. In, say, a 45-minute GP3 practice you don’t want to spend the first 15 minutes of that time learning the track. If you can minimise that to two or three laps after a simulator session it puts you a step ahead of everyone else. Also, simulators help me learn a lot about my own performance. 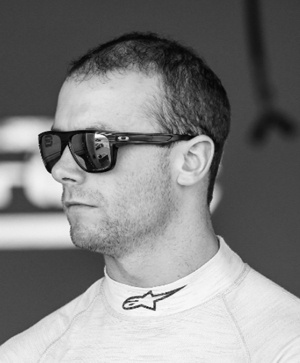 The car, weather and track conditions, and other variables are perfectly controlled, so I can look at my back-to-back runs and really focus on consistency and advantage opportunities. But the insight you get from that time is only as good as the simulator itself. To maximise the benefits you need something that will get you as close as possible to the sensations of driving a real car. My first visit to Ansible Motion was a fantastic experience. The physical feedback provided by the Delta series simulator was extremely realistic. In some simulators you rely on the graphics to spot the initial breakaway, but here you could physically feel it the moment the car began to slide. Ask the engineers at Ansible Motion and they’ll tell you the secret to this isn’t necessarily to try and replicate the G forces from a real car – which simply isn’t possible inside laboratory room – but the idea was to coax me into behaving as if I was in a real car. It’s a subtle distinction, but an important one. I find value in studying my own driving performance with data traces during a simulator session, just as I would at a real world session, and I was able to do that here. Ansible Motion’s technique relies on modelling the human vestibular system; effectively ‘mapping’ the desired sensations of movement to the physical motions required from the simulator. As far as I can make out, it is part neuroscience, part magic – but it works. It also cuts out the disorientation and motion sickness feelings that sometime come with driving simulators. Another noticeable step up from other racing simulators I’ve used was the image quality, which is developed by track mapping and graphics experts, rFpro. In this simulator, Ansible Motion’s vision system delivers a sharp, detailed picture, free from any perceptible latency or irregularities, so the rFpro racing circuits were exceptionally realistic. I personally feel it offers a different level of clarity if compared to the F1 simulators that I have experienced. The graphics quality was more akin to a plasma screen than a projected image. It was consistent right across the whole viewing range too – in a lot of simulators it starts to distort if you go more than about 45 degrees off your eyeline. This was more immersive and therefore more valuable. Ultimately, though, it all relies on the quality of the simulation. Sharper graphics, better vehicle models and improved feedback are all required for a more immersive experience. That, in turn, brings your simulator session closer to the real world. It’s clear that the engineers at Ansible Motion truly understand the issues faced in simulation. Drawing on their experience in vehicle dynamics and motorsport has helped them to create something very different, a breed apart from a normal simulator. And the results are spectacular.